At the turn of the millennium, many of us laboured to convince health organizations that non-communicable diseases (NCDs) were becoming the greatest challenge to global health. We used morbidity and mortality figures, as well as the cost and harm to quality of life and national productivity, to show decision-makers that conditions such as cardiovascular diseases, diabetes, obesity, cancer, lung diseases, depression, along with risk factors such as smoking, diet and physical activity, should be central to global healthcare. NCDs represent more than half the global burden of disease. Cardiovascular disease causes roughly half of NCD deaths. For a long time, NCDs were dismissed as “rich-country problems” and not worthy of global attention. But we now know that NCDs are a larger problem in low-income countries than in high-income. They are the price we pay for economic development, prosperity and major achievements in healthcare, which bring us longer, less arduous, but perhaps more stressful lives. When more than chronic condition occurs at the same time, the picture gets more complicated. 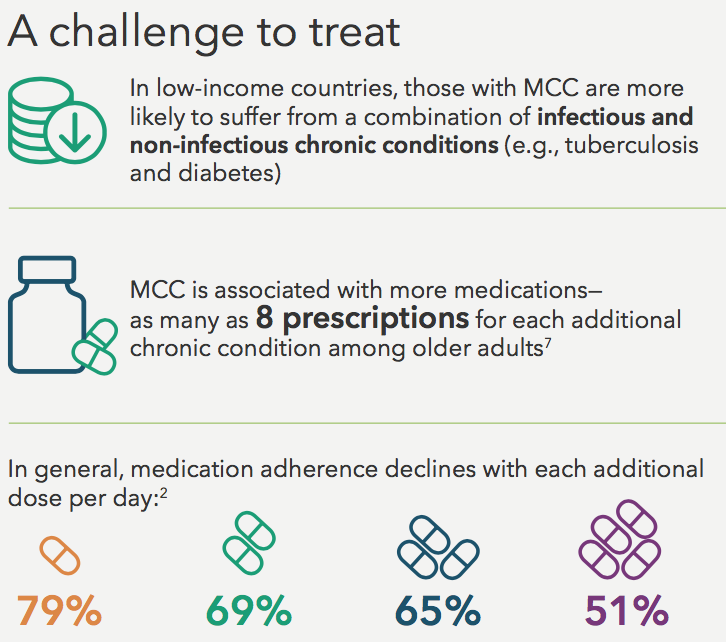 One in three adults worldwide has multiple chronic conditions: cardiovascular disease alongside diabetes, depression as well as cancer, or a combination of three, four, or even five or six diseases at the same time. Multiple chronic conditions have a profound impact on their sufferers. Costs and complications tend to grow exponentially, limiting mobility, increasing pain and fatigue and making it hard or impossible to work. These conditions require a large amount of medication to be kept in check. This often causes side-effects, further reducing the quality of life. Adhering to drug regimens becomes a challenge. The strain of living with such conditions, which can typically be managed but not cured, often leads to depression. 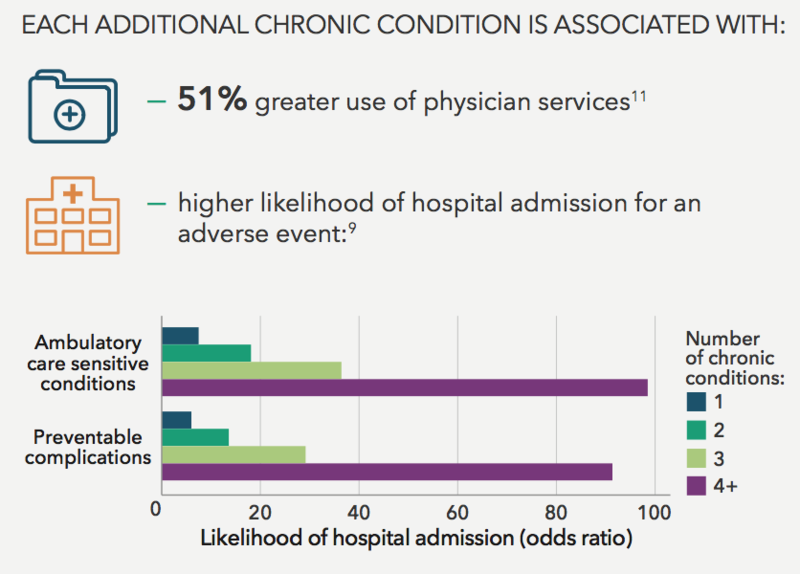 Such combinations of multiple conditions are a severe burden to healthcare systems. Most are structured to deal with one disease at a time. When a patient has several conditions, treatments and visits to the doctor tend to mount up. Not only is this awkward for the patient; it quickly gets very expensive. 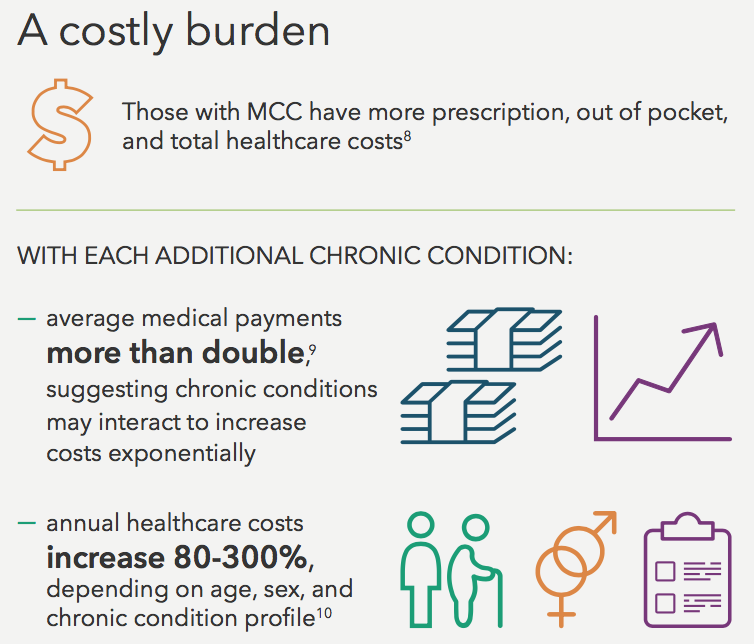 The complications and cost of treating multiple chronic conditions tend to double with each additional one, so that it is often 16 times costlier to treat a patient with four conditions than those with one. Re-organizing how we deliver health care and how we think about medication could address both problems. We can make care better and more humane, while reducing costs. An obvious long-term goal is to redirect health systems towards prevention. Instead of waiting until people have acquired irreversible conditions due to smoking, diet or lack of exercise, health personnel can help children and adults maintain a healthy lifestyle and address issues before they become incurable. This will take a long time. In the meantime, there is a lot we can do to improve treatment. The first step is to introduce – or reintroduce – the good old family doctor, and empower them. In the rush to modernize – or simply build – health services, many countries have neglected the role of the general practitioner. But this figure can see a patient’s needs in a holistic way and devise a balanced treatment regime. Much of the care that now takes place in hospitals can be administered by doctors and nurses in the community. Where hospital care is necessary, teams of doctors should work together on patients with multiple conditions, devising treatments and drug regimens that align. Finally, we can make it easier for patients to manage their own treatments. This includes understanding what prevents them taking their pills in their day-to-day lives, making it easier for them to do so while minimizing side-effects and complications. Adopting behavioural economics strategies, developing combination drugs and even monitoring whether tablets have been taken by using embedded sensors would help. We need to innovate how we monitor the progression and control of disease so patients can keep track of how they are doing by themselves. Managed effectively, these approaches could mean fewer tests and visits to the doctor and less frequent, shorter hospital stays. This means less costs. A patient would have to engage with fewer professionals, while having one designated professional to care about their whole wellbeing. This would help millions of patients regain a sense of control and an improved quality of life. Their over-stretched caregivers would benefit too. To get the ball rolling, here at Teva we decided to challenge ourselves. We started to investigate multiple chronic conditions. We recently launched a report illustrating the problem and offering directions for the future, during the World Economic Forum Sustainable Development Impact Summit during UNGA. We also partnered with the Arnhold Insititue at Mount Sinai, one of America’s largest hospital groups, to work with experts and patients. We are developing better ways to prevent, treat and live with multiple chronic conditions. Findings will be shared widely to help make any improvements available for all. We aim to achieve models for care that can be tested and scaled. Whether we live in Santiago, New York, Moscow, Delhi or Tel-Aviv, it’s not just better healthcare we need. It’s smarter healthcare. We need to re-think how we see patients, their treatments, and the structures that care for them in both their daily lives and in sickness. We need to build a healthcare system for the 21st century. This woman has seven income streams and says you should diversify your earning power.